Victoria has a diverse population with 24 per cent of Victorians being born overseas. A third of this group come from non-English speaking countries. Culturally and linguistically diverse (CALD) groups often have poorer mental health outcomes compared to Australian-born people, because they tend to present to services when their illness is more severe and therefore are also likely to experience higher rates of involuntary treatment. There are sub-groups articularly refugees and older people who are at risk of developing a mental health problem. Each year Victoria accepts over 3,500 humanitarian entrants (refugees and asylum seekers). Victoria’s CALD population is increasingly being dispersed across the state. in regional and rural areas which requires primary health and mental health services provide culturally appropriate care. Almost half of all CALD Victorians report having experienced some type of discrimination based on their ethnicity or nationality. Experiences of discrimination are associated with depression, stress, anxiety and problematic substance use. Build on the work of Victorian Transcultural Mental Health and the Action on Disability within Ethnic Communities (ADEC) to improve training. In the last week of March 2015 I was honoured to be one of six panelists ranging from consumers, carers, filmmakers, and mental health practitioners to be part of a panel at an event called Migrating Minds: A forum on mental health within Culturally and Linguistically Diverse (CALD) migrant communities.The panel was organised by Colourfest in partnership with Victorian Transcultural Mental Health and held at the State Library of Victoria (SLV). Colourfest celebrates films about diaspora and migrant experiences and shares them with the broader community through free events, professional development/training, distributing films and producing resources. What was especially wonderful about Colourfest was that consumers and carers were central to the event and got to tell their own stories in the films at the start and in the panel discussion at the end. The event began with seven short films which were stories told by people with a personal experience of mental health issues and perspectives of relatives/carers. Five of the short films were produced by Multicultural Mental Health Australia (MHiMA) and Victorian Transcultural Mental Health. There was also an international short film produced by a second-generation Vietnamese-American who shares their experiences with Depression and Post-Traumatic Stress Disorder. These fabulous examples of cross-sectoral collaboration were evident in the partnership between Mental Health in Multicultural Australia (MHiMA) in conjunction with the Australian Centre for the Moving Image (ACMI) to produce Finding our way. This unique project focused on migrant and refugee stories where the personal stories of people living with emotional and mental health issues who were negotiating migrancy. Managed by Victorian Transcultural Mental Health (VTMH), St Vincent’s Hospital, Melbourne and the Global and Cultural Mental Health Unit at the University of Melbourne. Erminia Colucci & Susan McDonough coordinated the project for MHiMA. We watched The Visual Conductor by Maria. A story about family expectations, taking charge and staying well involving art, personal goals and play. We also viewed Dear Self by Akeemi, which was about childhood memories, moving to a new country, feelings of isolation and efforts to connect including original drawings and paintings. Both Maria Dimopoulos and Akeemi from the Finding Our Way film project were also on the panel. The Our Voices project told the stories of carers from refugee and migrant backgrounds through five short films, showing a poignant insight into the lives of carers from migrant and refugee backgrounds. At the Colourfest panel we were fortunate to view Kevser‘s story. Kevser arrived from Turkey in the late 60’s with her husband and is the primary carer for her daughter. What was extraordinary about this film and the other four (from Afghani, Egyptian, Somali and Vietnamese communities) were the common challenges they faced in finding culturally sensitive and culturally-responsive mental health care and support. The aim of the forum was to help healthcare practitioners, community workers and the general population to understand some of the needs of the CALD community and the films were a powerful mechanism for leading the audience to empathise with the experiences of families. Leyla Altinkaya spoke on behalf of her mother, Kevser on the panel. Our other panelists were Munira Yusuf , a young person speaking from a youth perspective on their lived experiences with mental health issues and David Belasic: A psychologist based at Drummond Street Services. He has a strong interest in community psychology and queer mental health. Me answering a question from Pham Phu Thanh Hang Colourfest Melbourne Coordinator. 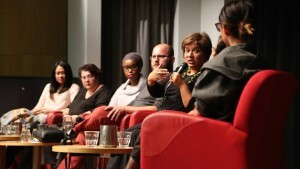 Also in the shot from left to right, fellow panellists Akeemi, Maria Dimopoulos, Munira Yusuf and David Belasic. One of the priorities of The Framework for Mental Health in Multicultural Australia: Towards culturally inclusive service delivery is that services evaluate their cultural responsiveness and develop action plans to enhance their delivery of services to CALD communities as part of core business. Central to this responsiveness is having processes where consumers, carers and family members can have a say in the planning, development, delivery and evaluation of services. Particularly important given that CALD consumer and carer participation lags behind mainstream participation. Hence, the importance of this event which placed the experiences of consumers and carers at the forefront. Readiness to adapt behaviours and communicative conventions for intercultural communication. What’s lovely about this list is that it does not constitute a recipe or tick box that can be memorised and then deployed in every intercultural encounter. These qualities are about how we developing a capacity for being in relationship with other people when we cannot assume common ground (which is really kinda always). I believe that watching the films provided a way to facilitate the beginnings of such a journey.. I am grateful to all those who made the films happen and for making visible the experiences of CALD consumers and carers. A grateful thanks to Gary Paramanathan and Pham Phu Thanh Hang Colourfest Melbourne Coordinator for the opportunity to be part of this wonderful panel. the diversity of society in terms of cultural identity, nationality, ethnicity, language, and increasingly faith. Individuals from a CALD background are those who identify as having a specific cultural or linguistic affiliation by virtue of their place of birth, ancestry, ethnic origin, religion, preferred language, language(s) spoken at home, or because of their parents’ identification on a similar basis. CALD does not refer to an homogenous group of people, but rather to a range of cultural and language group communities.